NEW BRITAIN - Fire Capt. Jim Brody kicked off Rebuilding Together New Britain a little early this year by replacing a roof with a team of volunteer firefighters last week. 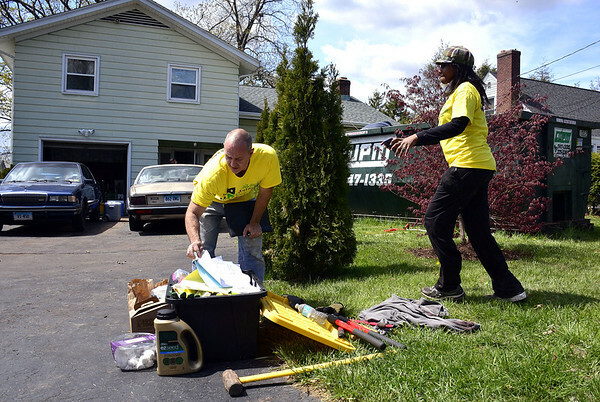 The annual event, which takes place on Saturday, will draw about 350 volunteers who will help 15 families or individuals who need help in sprucing up their home. For the past 15 years, Brophy and a volunteer team of city firefighters installed a roof in the days leading up to event or after the event so that their work won’t disturb the process as the teams on Saturday work to paint, trim shrubs, rake leaves, install doors and whatever is needed for the families who can’t get the work done themselves. Each of the families is low income and has been chosen based on eligibility. Sponsors throughout the area provide the materials and New Britain Fire Department and other agencies and groups lend their time to get the work done free of charge. To learn more about Rebuilding Together and the yearly effort to help low-income families in New Britain, visit its website at rtnewbritain.org. Posted in New Britain Herald, General News, New Britain on Monday, 24 April 2017 22:05. Updated: Monday, 24 April 2017 22:07.